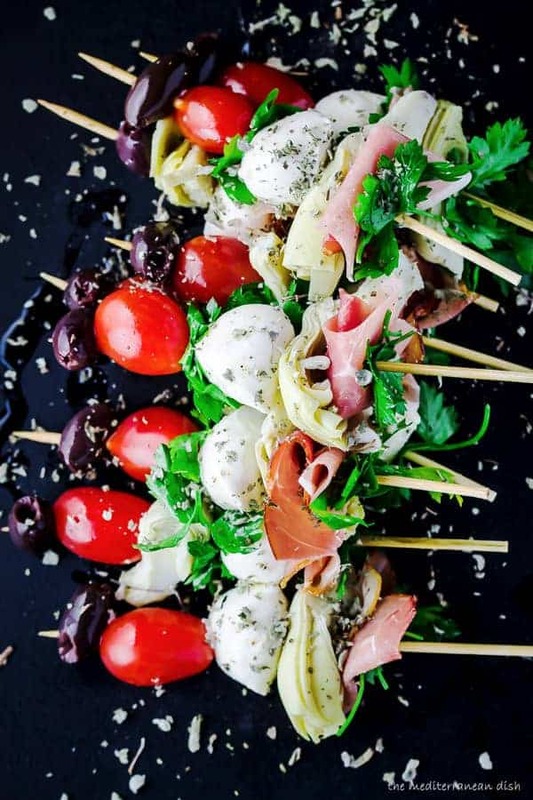 These antipasto skewers are a last-minute-appetizer that is sure to please a crowd! Select items that compliment each other in color, texture, and substance. I show you exactly how in this post! Like tapas in Spain, or mezze in the Middle East, antipasti are Italy’s way of setting the stage for dinner. They’re Italian appetizers selected carefully for their color, texture, and substance. 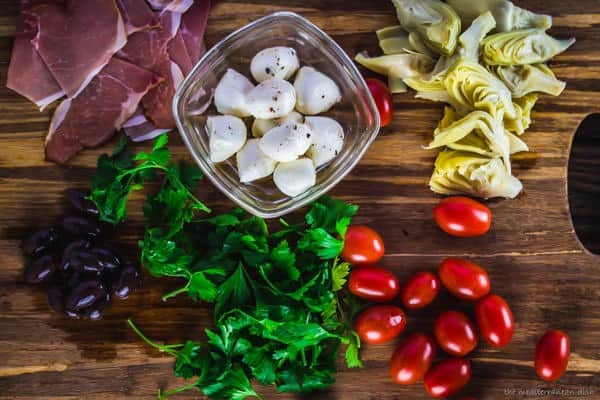 Antipasti typically includes anything from fresh vegetables or fruit; marinated vegetables; olives or pickles; cheese; and cured meats. Some may even include seafood like shrimp or anchovies. I love the idea of a loaded, cornucopia-type antipasto and cheese board like this one. 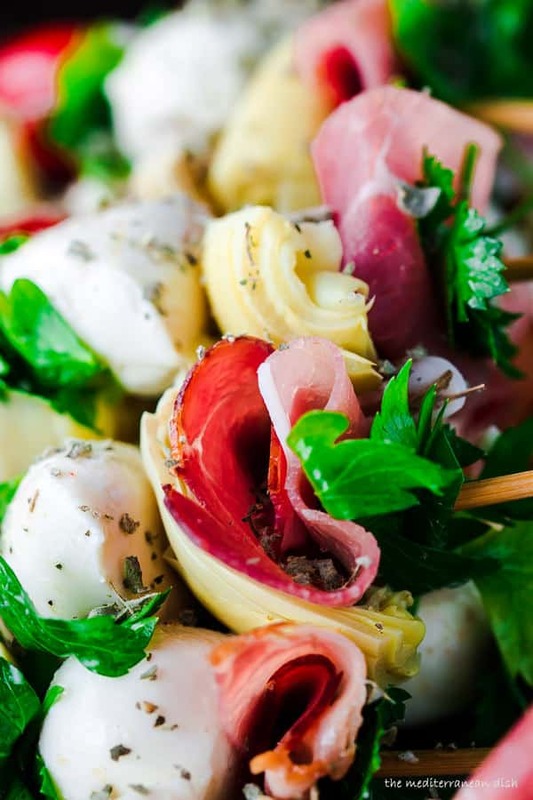 But, these beautiful and festive antipasto skewers are a great way to present antipasti as easy-to-handle finger food. Plus, they require fewer ingredients. 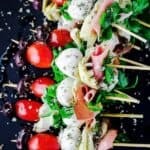 To make these antipasto skewers, you’ll need are some mini wooden skewers and a few of your favorite antipasti. Note: I like to soak the skewers only to avoid splinters, but this is not a necessary step. When selecting which antipasti go on my skewers, I keep in mind: color, texture and flavor. I find a choice of fresh vegetable with one or two marinated options is sufficient. In this case, fresh cherry tomatoes with marinated artichokes and olives. For the cheese, mini mozzerla balls work perfectly here, but you can also use a cubed mild cheese of your choice. And for the meat, my choice is often prosciutto. This is optional, but I like to add a fresh herb for flavor and taste. Basil is often the choice, but you can use mint or parsley. There is no right or wrong way to thread the antipasto through the skewers. Simply pay attention to size, color and shape. I like to start with the fresh herb, then add the larger piece of meat as a base for my skewer. From there, alternate the rest of the ingredients, ending with an olive (the smallest item) at the very top of the skewer. 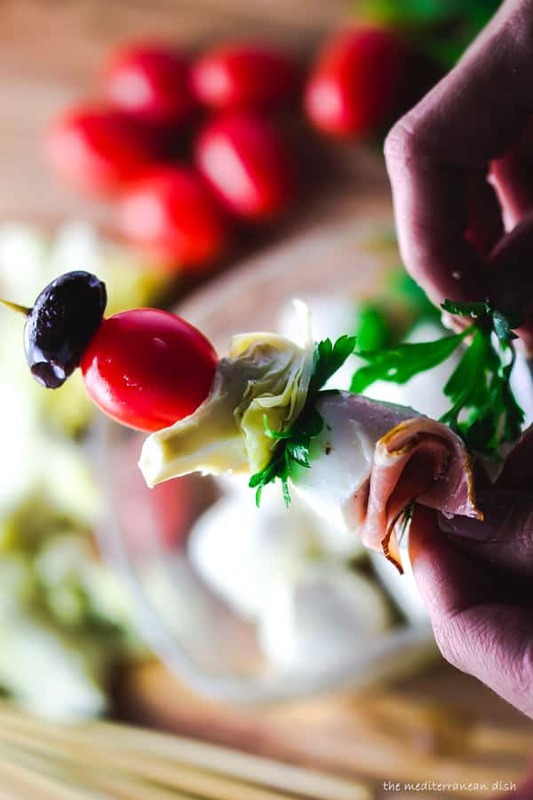 Once you put together one antipasto skewer, try to follow the same pattern as you make the others. This keeps things looking consistent and pretty. Remember, you can make these antipasto skewers your own. Switch things up by adding cooked shrimp instead of cured meat. Or keep things completely vegetarian by using more fresh and marinated veggies. Simple antipasto skewers with tomatoes, marinated vegetables, cured meat, and fresh herbs. A beautiful and festive appetizer to please a crowd. This recipe yields 10 skewers, you can easily double or triple it for a larger party. Soak mini wooden skewers in water for one hour. Pat dry before using. Skewer the antipasto ingredients beginning perhaps with the basil or parsley, followed by the larger pieces like prosciutto or artichoke hearts. Place the Kalmata olive at the very top of the skewer. If you have more basil or parsley leaves, alternate them on the skewer. Arrange skewers on a serving platter or slate board. If you like, finish with a sprinkle of dried oregano and drizzle of Early Harvest extra virgin olive oil. Serve cold or at room temperature. Pro Tip: You can easily double or triple this recipe if you need to serve more people. You’ll just need to have more of each of the ingredients to prepare more skewers. Pro Tip: Antipasti will taste slightly better at room temperature. Love this appetizer! Super easy with tons of flavor. They were a huge hit! Definitely making them for every party. Such a great appetizer for any party! Holiday, game day, pot luck! Definitely tucking this one away. Just curious – why do you have to soak the skewers, if you’re not cooking them? Isn’t that the only reason to soak skewers? So they don’t burn when grilled or cooked? Is there a reason they’re being soaked in this recipe? Hi Trinette. Great question. I soak them because I don’t want them to start splitting and get into the food. It’s not necessary if you don’t want to do that, but I also find that it makes it easier to work with. Making antipasto skewers today for family chili dog fest, will post after what everyone thought! Enjoy! Hope everyone loves them. Yum would be great for BBQ’s too! Where can I purchase sumac! Just saw (and pinned) this on Pinterest. What a cute, quick, easy, delicious idea! And all the flavors I LOVE! Can’t wait for our next gathering to try these! Thank you for the great idea! Deb, thanks so much for stopping in! I’m into antipasto, and this is such a simple and functional way to share them with others. Thanks for taking the time to leave me a note. Our guests have already left but we’ll have friends over tonight to watch the fireworks, party and ring in the new year. I think these skewers are great. They only require one hand! Maureen, Happy New Year, friend! I wish you an awesome 2015. Thank you, Renee! Happy New Year. I usually make a killer antipasto platter on NYE.. as it’s easy to nibble as the night goes on. I definitely will be adding these antipasto skewers to my platter tomorrow, thanks for the incredibly delicious idea! Great, Thalia! Happy New Year! My hubby loves Italian sandwiches and I often find him sneaking them when I’m not around. This is a less carby alternative that I think would be perfect when he gets that craving. Thanks for sharing. Lynn, thank you for stopping by! I am all about antipasto, and I found that this is such a convenient way to serve and consume them. Happy New Year! Please stay in touch. These would make an amazing NYE appetizer Suzi! Great flavors and festive look! Pinning! Have a Happy New Year’s Eve! Thank you for pinning, Mira! Happy New Year! I make a similar skewer but need to add some of the extras you have on yours. Yum.